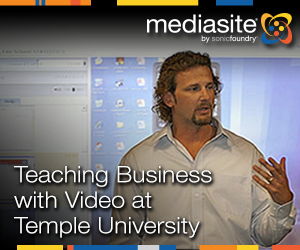 Temple University’s Fox School of Business is among the largest, most distinguished business schools in the world, and faculty use the newest technologies to transform the way business students learn. The use of academic video has exploded in the school and is deepening engagement, personalizing learning and ultimately improving learning outcomes and retention. At the center of all the school’s academic video initiatives is Darin Kapanjie — a full-time instructor in the Statistics Department since 2001, the manager of online education and educational technology and the academic director of the Fox Online MBA Program. Kapanjie is committed to teaching beyond the physical classroom and is known for using cutting-edge teaching technologies. Presenter: Dr. Kapanjie, who joined Fox’s Statistics Department in 2003, is committed to teaching beyond the physical classroom. He is known for using cutting-edge teaching technologies, and was an early adopter of Class Capture, Wireless Tablet Annotation, Pearson’s MyLabs, and he was the first to use WebEx web conferencing tools to teach synchronous online classes. Dr. Kapanjie serves as the Fox School’s Managing Director of Online & Digital Learning and is the Academic Director of the Fox Online MBA and BBA Program’s. He serves on numerous curriculum and technology committees and has helped infuse the use of efficient, reliable and user-friendly technologies throughout the school.